Fans were overjoyed when Bryan Singer returned to the X-Men franchise, having kickstarted it back in 2000. While it was his return for 2014's X-Men: Days of Future Past was welcoming, one wonders if it's better to hand the reins to other directors. After an accident caused by Moira McTaggart (Rose Byrne), the first mutant is awakened from his long slumber. Going by the name Apocalypse (Oscar Isaac), his disillusionment with the world leads to recruiting powerful mutants, to cleanse the world of mankind, creating a new world order which he shall reign over. Raven (Jennifer Lawrence), with the help of old friend Charles Xavier (James McAvoy), must stop this destructive force, and save mankind. Franchise veteran Bryan Singer returns to direct his fourth film within the franchise, and manages to bring two more franchise stalwarts. Once more, a huge cast is brought to the screen, while lacking adequate enough screentime or character development to be shared between them. The messy timeline also returns, unless it's feasible for Lucas Till's Alex to not look a day older in the 21 years since X-Men: First Class occurred (while looking just older than Scott). His attempts are ambitious, as Singer looks to closing off the storylines of the characters who've been with us since 2011's Matthew Vaughn directed picture. On top of that, a new class is recruited with clear intentions to take over the franchise, while the return of Quicksilver and Moira McTaggart are handled, all while delivering some kind of story for the antagonists. It's a clear overdose of plot-lines, and the picture feels overstuffed and messy in its attempts to juggle them all. Considering the rising popularity of Jennifer Lawrence, and Hugh Jackman leaving behind his famous role, one gets the impression she's being made into the new face of the franchise. Perhaps that's why her character is developed more heroically than her previous incarnation (portrayed by Rebecca Romjin), and why a flimsy reason is made to keep her out of the blue make-up for a considerable amount of time. Whatever the reason, Lawrence does a decent job in the role. Michael Fassbender's portrayal as Erik Lehnsher remains a franchise highlight, as we see he's settled down and had a family since the previous films events. As his fortune turns sour, the anguish he suffers is perfectly conveyed. This makes it all the more unfortunate when his role as Horseman reduces him to little more than muscle. James McAvoy remains terrific as Charles Xavier, now Headmaster of his own school, which makes it a shame he's stuck in a sub-par romance subplot. As for the friendship shared between the two, the heavy lifting is given to flashbacks from the previous films. The barrage of footage from prior X-Men films feels heavy handed, leaving the "show, don't tell" approach to be rather irritating. But it's the villains who truly suffer. Oscar Isaac has proven his acting prowess multiple times over, and his casting as the X-Men's biggest bad seemed like a match made in heaven. 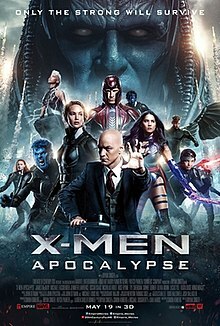 In a franchise which offers allegories for racism and homophobia, the title villain offers an extreme example of hope for the mutant population, which leaves much destruction in his wake. The result unfortunately leaves Apocalypse as a dull figure, delivering bland pieces of dialogue to "tempt" the first couple of Mutants he comes across, before actually looking for those with strength. His Horsemen fare somewhat better. With the lacklustre attempts at character development and whatever small parts of dialogue get thrown her way, Alexandra Shipp doesn't get to make her mark on the Storm character. Which remains more than Ben Hardy and Olivia Munn's characters receive, who are wasted in thankless roles. The real shocking part isn't the amount of collateral damage which is brought to the screen, but how quickly its forgotten about and never mentioned. It's feels too easy to mention Jean's knowing dialogue about third film being the worst, but the lacking writing and overly-busy feel just goes to prove this right. The picture merely feels like a placeholder, existing to get the characters to where they're better known at. But in spite of the evident problems, X-Men: Apocalypse remains packed with thrilling action and a charming ensemble. Well, for the most part.